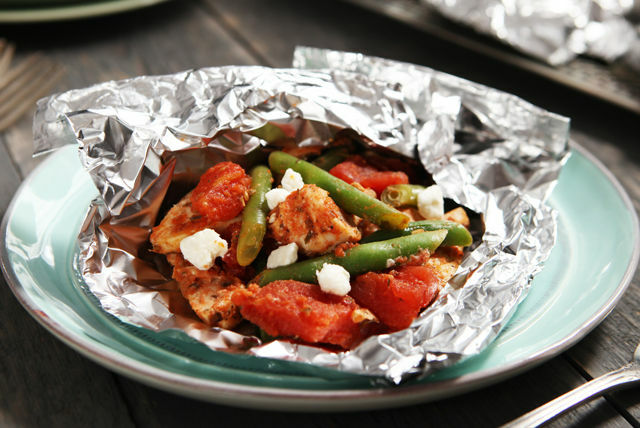 Chicken breast strips, green beans, tomatoes and seasonings are grilled in foil and then topped with feta cheese for an enticing main dish. Combine all ingredients except cheese; spoon onto 4 large sheets heavy-duty foil. Fold to make 4 packets. Grill 10 to 14 min. or until chicken is done. Cut slits in foil to release steam before opening packets. Top chicken mixture with cheese. Fill foil packets as directed; place on baking sheet. Bake in 450°F oven 20 to 24 min. or until chicken is done. Substitute 1 drained can (14 fl oz/398 mL) cut green beans for the cut-up fresh green beans.